20717 EXP142.jpg 500X638\EXP142.jpg Send A Hint! 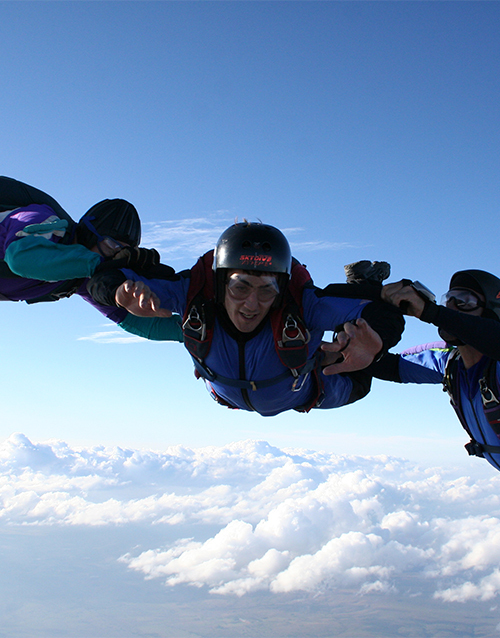 Accelerated Freefall (AFF) is the fast track program designed to turn you into a competent skydiver in the shortest period of time. It will require you to attend ground school (+/- a 5 hour course),which we offer every Saturday or Sunday. On your first jump, two highly experienced and specially trained instructors will hold your parachute harness as you exit the plane and experience 40 seconds of free fall.They will be at your side to coach, assist, and evaluate your performance.After you open your parachute you will enjoy about a 5 minute parachute ride,after which you will need to make your first solo ‘square parachute’ landing,as your instruction has prepared you to do. Subsequent AFF training"Levels" are designed to add to your skills and self-confidence.Starting with Level Four, you will have one Instructor. You can be "off instruction" and qualified as a novice parachutist in as few as ten jumps. membership till end of year, Logbook. Get this Accelerated Freefall delivered with NetFlorist.